Walker draws these figures on a very immense scale. Some can be as tall as fifty feet, and can have a circumference of 85 feet. She creates these enormous, life sized cutouts by laying large black papers on the floor without using any references, such as models or photographs. She then draws outlines of the figures in white chalk. After that, she cuts the silhouettes out and puts them onto a white wall. When Walker draws these figures she is very precise and often exaggerates their facial features, body shapes, and clothing to identify the ethnicity of her subjects and define race. 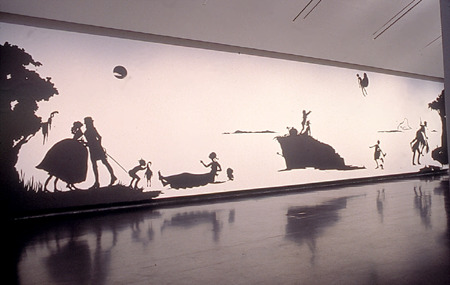 Kara Walker is a great story teller as well as a great artist. She draws from southern romance novels, historical fiction, slave narratives, as well as contemporary novels to aid her storytelling. Despite the serious subject matter of slavery, power, and racism, Walker is able to add humor to her artwork that ranges from cynical and sarcastic to “toilet” humor. She also uses humor by making the silhouette like caricatures. She uses this to exaggerate their physical features to emphasize their race, and position of power. Political cartoonists do this same thing of exaggerating features to laugh at current events and politicians, even when the subject matter is serious. The inclination to find these works funny is because of the sense of discomfort they cause. It’s amusing not only because the characters are funny, but the amusement comes from the shame one feels because one is laughing at suffering. In this way Walker pushes the limits of humor and challenges what the viewer thinks is comical. I knew that if I was going to make work that had to deal with race issues, they were going to be full of contradictions. Because I always felt that it's really a love affair that we've got going in this country, a love affair with the idea of it [race issues], with the notion of major conflict that needs to be overcome and maybe a fear of what happens when that thing is overcome— And, of course, these issues also translate into [the] very personal: Who am I beyond this skin I'm in? These two artworks are narratives from history and describe historical stereotypes. They allow the viewer to almost become part of the art and be inside of it because it is on such a grand scale. The viewer is able to imagine a story and scenario. The scenes are frozen on the wall and are fragmented from one group of figures to the next, so the viewer has to fill in those gaps with their imagination. The viewer is allowed to have an emotional response; you can feel enjoyment, hatred, love, desire, or fear in any one of her works. Kara Walker is one of the youngest recipients of the John D. and Catherine T. MacArthur “genius grant”, which she received at age 27. Her work has been exhibited in galleries and museums worldwide. She currently lives in New York, where she is a professor of visual arts at Columbia University. Her latest work is in the 2007 Walker Art Center, which is an organized exhibition called Kara Walker: My Complement, My Oppressor, My Enemy, My Love. 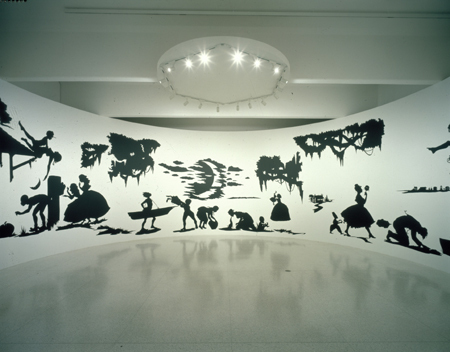 Kara Walker has created a unique style and retells stories of unique historical accounts of slavery, racism, violence, and sexuality which evoke strong emotional responses from the art community. There is an Art21 video on PBS about Kara Walker, and the video gives a better sense of how Walker's artwork is laid out for the viewer. It is difficult to see from the pictures in the blog, but the background of her silhouettes are full of imagery as well...usually Cypress tress and moss. These background images transport her work from being a two dimensional work into a three dimensional, panoramic experience. I believe you are correct that she is using humor as a device toward self-awareness of our own biases toward racial issues. Even with the uncomfortable subject matter, though, her panoramic artwork has some of the most breathtaking imagery I've seen. I suggest linking to the Art21 video on Walker...it will make her artwork more appealing on your blog than the two pictures you've chosen. I love this piece! It reminds me of silhouette portraits and the old "plantation stories" I used to read as a kid. I love the way that the artist has taken this new modern style and mixed such an old way of developing pieces together it really keeps a historical feel to the work! Great choice!